Excellent service. Very reasonable price. Chuffed. Despite receiving a damaged battery from Tayna and not having the time to return it, Tayna responded immediately and sent me a replacement to the address I moved to just the next day and refunded me the express delivery charge too! I am very impressed with this speedy and conscientious level of service, Thank you Tayna. I take my hat off to you. Adapté à: Wasn't a motorbike! Received email from TAYNA explaining what they had done and what I needed to look for prior to fitting the battery 5* I like the way the captive nuts, once in the +/- posts do not move like some types of battery. The battery is very powerful and cranks my big old Benelli 1130 tnt over without fuss another 5* TAYNA are a great Company to deal with. 5* for delivery too! Top quality product arrived super fast and at the best price going. Excellent battery fitted as an upgrade after advice from other owners of the same bike. Terminal fittings best I have had. This battery is a great product and more powerful than my stock battery. Easy to prepare and install. Works extremely well and very good value for money. I replaced like with like. The old battery served me well f or a couple of years without any hint of trouble before reaching the end of its life. The new one is reliable. Should have got one of these ages ago for my RST1000, spins up beautifully, loads of oomph. I ordered this battery at 3pm and received it at 10.30 am next day!!! Excellent service ******(6 stars). 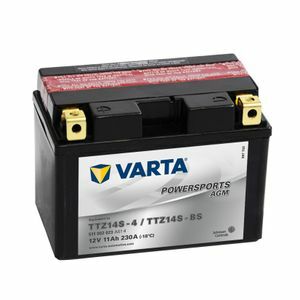 Varta do not recommend installing this battery on it's side so I had to mod the battery box for an upright installation.